Summary: From Katrina Kittle, critically acclaimed author of The Kindness of Strangers, comes a wry and moving story of forgiveness, flexibility, happiness, and the art of moving on. Over two years ago, I read THE KINDNESS OF STRANGERS by Katrina Kittle, and I absolutely adored the book -- you can read my review here. I just knew that I was going to be a big fan of Ms. Kittle's and I was anxiously awaiting the release of her next novel. So when I was at BEA and talking with the Harper Collins folks and I asked them what new releases they were excited about, they mentioned THE BLESSINGS OF THE ANIMALS! Oh yeah -- me too! I was fortunate enough to receive an ARC of THE BLESSINGS OF THE ANIMALS at ALA after some not-so-subtle begging on Twitter! I thought the premise of the book just sounded so good. A veterinarian named Cami finds herself suddenly single when her husband of 17 years decides he doesn't want to be married anymore. She is left to pick up the pieces of her own life along with dealing with her teen (and angst ridden) daughter and having to manage a very successful veterinary practice. I just love it when books explore real women with real issues -- and it helps when they are close to my age! I absolutely loved Cami and thought that her character was extremely well developed. My heart went out to her when her life was turned upside down. I thought her reaction to the end of her marriage was very honest and I could relate to her feelings as well as the questions she asked herself about trying again and starting over. I also thought the portrayal of her teen daughter as well as Cami's relationship with her were realistic. Now, I don't claim to be a huge animal lover, but I do believe wholeheartedly in the healing properties of animals. And I loved how this novel addressed that. While Cami was probably even more of an animal lover than the average animal person, I thought it was so interesting how her need to "save" animals indicated a larger essence of her personality -- Cami felt that she had to save everyone....especially her husband. What I really appreciated about this novel was when Cami realized that she couldn't save everyone and that she needed to start saving" herself! 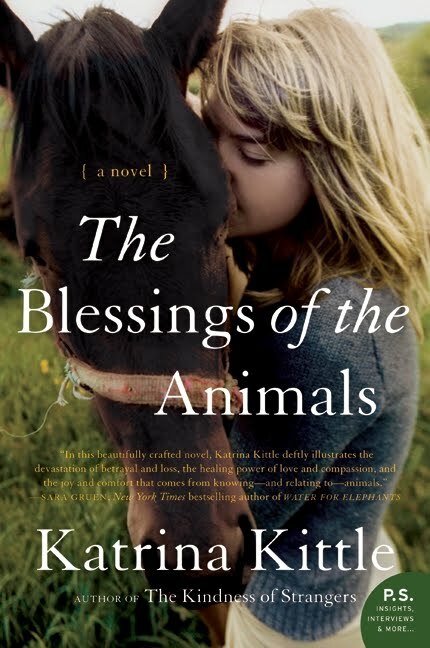 I thoroughly enjoyed THE BLESSINGS OF THE ANIMALS and it was pretty much what I was expecting from Katrina Kittle. I'm not sure I'd go so far as to say that I liked it more that THE KINDNESS OF STRANGERS though. Having said that, I still enjoyed Cami's story and I quickly became caught up in the struggles of her life. I thought Ms. Kittle did a great job with the supporting characters as well as the secondary storylines, and I think that many women (and animal lovers) will just love this novel! It was just that there were quite a few secondary issues also included in the story like animal abuse, anorexia, adoption, and gay marriage that weren't as fully developed. It's not that I didn't find all of these issues to be interesting and worthy of inclusion in a novel. It's just that I felt as if some of them were pretty major issues and I wanted something more. For example, Cami had suffered as anorexia as a teen and she began slipping back into her past behavior when her husband left her. However, I didn't really feel as if her struggle was fully explored in the book. I'm probably in the minority on this, but I didn't understand how Cami managed her disease. I do think THE BLESSINGS OF THE ANIMALS would be a great book pick! There is a reading guide for the novel which includes some very thought-provoking questions. Of course, Cami is just a wonderful character and her actions and motivations would be so interesting to discuss. However, there are also some other topics that warrant further discussion including marriage, divorce, commitment, the act of loving, mother-daughter relationships, healing, animal abuse, gay rights, adoption, eating disorders, forgiveness, and new beginnings. I really, really liked THE BLESSINGS OF ANIMALS and I think if you are a fan of women's fiction (or just love animals), then you will definitely want to check it out! I liked this book a lot, but I understand and agree with you about the anorexia - it seemed that Cami could just turn it on and off as she pleased, and that's not how it is in real life. Fantastic review! Nice review, Julie. <> My take on the anorexia topic was that Cami's husband "saved" her when they started dating and then married. It was perhaps why she stuck in the marriage and made excuses for him for so long - she may have felt she owed him for what he did for her. Just my theory. Not having any personal experience with the disease I'm guessing one isn't cured but recovers so maybe it never truly goes away? That is kind of weird about the anorexia of convenience, but I still am looking forward to reading this! Great review! Lovely review. But I cringe a little at animal abuse. For some reason, that's one of those things that really gets to me. I am so glad you liked this one. Another great Harper Perennial pick. I don't have any personal experience with anorexia and I'm no expert, but because it is a psychological disease, I'm not sure it always follows a set pattern.